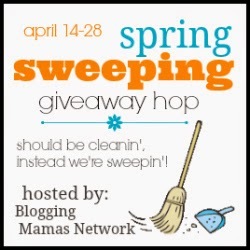 Welcome to the Spring Sweeping Giveaway Hop, hosted by the Blogging Mamas Network. The days are getting warmer, brighter, and longer which may lead many to start Spring Cleaning. But we're not ready to start cleanin' until we're done sweepin'! Take the next two weeks to sweep along the fabulous giveaways that a group of bloggers have come together to offer you! 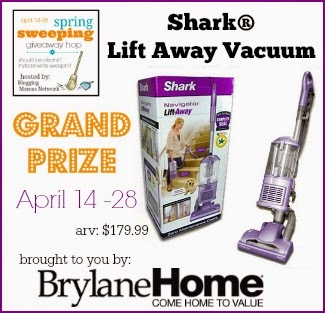 Be sure to hop around to all the giveaways, in the linky below, and just maybe the Grand Prize of a Shark® Lift Away Vacuum, from Brylane Home, will get someone in the Spring Cleaning mood! You can enter the Grand Prize here. RingStix is an award-winning toy that is perfect for engaging outdoor play for ages 6 and up. It's super eaay to learn and so fun to play. You can pay a fast-paced, high-energy game or at a more leisurely pace if you prefer. 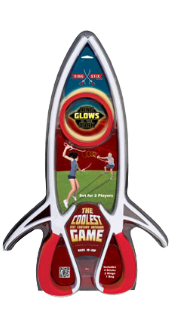 It's a launch and catch game that attracts adults and kiddos alike. We recently played at a family get-together and everyone loved it! RingStix are lightweight and the rings float and can be used in high winds, which makes them perfect for beach play. RingStix Pro comes with 4 stix, 2 rings (one of which is glow-in-the-dark) and a carrying case. How it works: "Each player holds two sticks which he uses to propel the ring spinning forward toward the other player. The catching player then uses the end of one or both of the sticks to catch the flying ring. This repeats back and forth while spinning, leaping and laughing. Families can invent their own way of playing, keep score and do tricks - it's a new game every time!" Get the whole family up and moving this Spring! ABCD Diaries gives RingStix an A+! Find out more about this fun outdoor game at RingStix! So Easy Being Green, Viva Veltoro, the Blogging Mamas Network, and the Showered with Love participating bloggers are not responsible for sponsors who do not fulfill prize obligations.